Polruan Bed and Breakfasts. Compare latest rates and Live availability for all your favourite places and places you have always wanted to go using our new My Shortlist feature. Click + to add to your Shortlist. Bed and Breakfasts in Polruan, Cornwall for 1 night from Sun Apr 21, 2019 to Mon Apr 22, 2019 within 10 miles, in an Average Nightly price range of £1 to £200. Set in beautifully landscaped gardens, right by the water's edge, the award-winning Fowey Harbour Hotel has a scenic and peaceful location. It offers free WiFi, an award-winning restaurant, and a 24-hour front desk. Many of the individually decorated, en suite rooms offer panoramic views of the harbour, as do all of the public rooms. Each also has a TV and facilities for making tea and coffee. The pretty town of Fowey is a joy to wander around, with its charming shops and galleries. The town centre can be reached in around 5 minutes' walk from the hotel building. The Fowey's restaurant has held an AA Rosette for the outstanding preparation of its food and the quality of its local, seasonal ingredients. Less than 5 miles from the Eden Project, the 4-star rated Royal Inn in Par offers attractive en suite rooms and a full English breakfast served in the conservatory. A 2-minute walk from Par Train Station, this Cornish inn has an extensive restaurant menu and provides free Wi-Fi and on-site parking. All rooms at The Royal Inn have an en suite bath and overhead shower, hairdryer, laptop safe, flat-screen TV with DVD player and tea and coffee facilities. One has a four-poster bed, and there are family rooms and a room with disabled access. Freshly prepared full English breakfast is served each morning, along with a buffet selection including fruit, juice, cereals and yoghurts. An early continental breakfast is also available if arranged in advance. Six miles east of St Austell, The Royal Inn is a 13-minute drive from the spectacular Eden Project, and a similar distance from Fowey, formerly the home of Daphne du Maurier. Truro and Newquay are both within 35-40 minutes' drive. Located in an Area of Outstanding Natural Beauty in St Austell, Cornwall, Vine Cottage family-run B&B dates back to the 17th-century and is just 2.2 miles from the Eden Project and 3 miles from Par Beach. It offers a garden, terrace and shared lounge with TV along with free WiFi. The rooms come with tea and coffee making facilities and garden views. They also have an en suite bathroom with free toiletries, hairdryer and shower. Every morning, guests will enjoy a full English breakfast served in the property's traditional dining room. It features locally-sourced produce whenever possible. Free parking is available on site. Guests can drive 5.6 miles to Fowey or 4.5 miles to Charlestown Harbour. The closest Railway Station is situated in Par, 1.8 mile away. Penarth Guest House is a spacious detached house with three high quality ensuite guest rooms set in its own grounds at the edge of the village of St Blazey Gate just 5 minutes’ drive from the Eden Project. PENARTH GUEST HOUSE is a spacious detached house with three high-quality en-suite guest rooms set in its own grounds with on-site parking at the edge of the village of St Blazey Gate just five minutes drive or about a 25-minute woodland walk from the Eden Project. This part of the south Cornish coastline between the River Fowey to the east and the River Fal to the west is known as the Cornish Riviera for its beautiful gardens palm trees and fine weather. Outstandingly beautiful and steeped in history the area offers many attractions for all tastes from award-winning gardens to pirates. br / br / br / br / The guest accommodation is maintained to a high standard and the rooms all have a Freeview TV with built-in DVD player fast reliable wi-fi hairdryer trouser press and tea and coffee making facilities. An iron and ironing board are also available. Rates are fully-inclusive of breakfast and we are very pleased to consistently receive highly-complimentary reviews regarding our food! We are also proud to have been awarded a 5-Star Food Hygiene Rating. br / br / br / br / For evening meals within just a few minutes walk is The Four Lords a traditional local pub serving tasty food and for those who prefer more of a restaurant-style The Britannia Inn is a ten-minute walk in the opposite direction. Directly across the road is the Biscovey Fish Bar where guests can buy fish n chips which can be eaten in our dining room (we ll supply plates if needed and do the washing-up afterwards!). br / br / br / br / Visitors who like nothing better than visiting historic castles houses and gardens will find plenty! The nearby Eden Project is one of the most visited attractions in Cornwall and within easy reach are the Lost Gardens of Heligan Lanhydrock House and Gardens and the castles of Caerhays and Restormel - and for the Poldark fans Charlestown (where many of the harbour sequences are shot) is only a short drive away and it s only 20 minutes walk to the beach at Carlyon Bay and the South West Coast Path. From our country house hotel by the sea, the only thing we overlook is the bay. Our spectacular clifftop location offers a 180 degree sea view over Carlyon Bay. Set in award-winning gardens, this privately owned hotel is family-run and has the cosy ambience of a country house by the sea. We offer an ideal base for exploring Cornwall's many attractions. The South West Coastal Path is just yards from the hotel entrance and you can walk for miles along the coastline. We offer ample free parking in our private car park, disabled access to all public areas and high-speed Wi-Fi broadband access. All rooms are en suite and well-appointed. A children's tariff is available. Please contact reservations for full details. Our staff offer a warm welcome and friendly service. This combined with comfortable surroundings and delightful cuisine, ensure a memorable visit and one we are sure you will want to repeat. With our 28 well appointed en-suite rooms we are the best kept secret in Cornwall. Our spectacular cliff top location and 180 degree sea view over St Austell Bay makes us the ideal place to stay and explore Cornwall s many attractions such as The Eden Project and The Lost Gardens of Heligan to name but a few. Our award-winning chefs work closely with Cornish suppliers to bring you the very best and freshest seasonal produce. We have a selection of Superior Luxury and Standard en-suite rooms. The Porth Avallen Hotel is the ideal venue for any celebration and we can cater for groups of up to 150 persons. Our saying is: The only thing we overlook is the bay! Arriving at Boscundle Manor is like stumbling upon a well-kept secret. Hidden in a tranquil location where pretty terraced gardens meet ancient woodland the warm charm of the 18th century manor house is palpable from the moment your eyes fall on the frontage its rosy pink walls draped in lilac blossom and hugged by neat lawns and colourful flowerbeds. br / br / br / br / The rich character continues inside in the snug lounge with its deep velvety sofas and open fireplace in the dining room with its wooden floors sumptuous drapes and heady touch of grandeur and in the light and airy climes of the conservatory. The interiors combine style elegance and a charm befitting the building s historic character with a wonderfully welcoming and endlessly cosy ambience. br / br / The individually designed bedrooms are contemporary in style from bold jet black hot pink and modish flourishes to pretty pastels and chaise lounges there s a room for all tastes complete with luxe bathrooms and impeccable attention to detail. All relaxation needs are catered for: take a dip in the indoor pool indulge in a treatment in the Zento room and sink into the hot tub and gaze up at star-speckled skies. It s small wonder this chic sanctuary is deemed to be one of the region s most romantic hotels. With rooms made from shipping containers, YHA Eden Project is located 15 minutes' walk from the world's largest indoor rainforest. Each room at YHA Eden Project comes with an en-suite bathroom and a TV. A snack menu of sandwiches and paninis are on offer at the YHA, along with hot/cold drinks and a licensed bar. The Eden Project has a variety of food outlets available during its open hours. Local activities include hiking, cycling and watersports, Situated on Cornwall's south coast, the town of St Austell is just a 15-minute drive away from the hostel. Set in Looe, The Jubilee Inn features accommodation with free WiFi and a garden. A Full English/Irish or vegetarian breakfast is available each morning at the property. The bed and breakfast offers a terrace. Plymouth is 42 km from The Jubilee Inn, while Padstow is 50 km from the property. The nearest airport is Newquay Cornwall Airport, 51 km from the accommodation. A 2-minute walk from Lostwithiel Train Station, the Earl of Chatham offers bed and breakfast accommodation with free parking and Wi-Fi. This 16th-century Cornish inn is less than 20 minutes' drive from St Austell and the Eden Project. Each guest room has a flat-screen TV and tea and coffee facilities. There is an en suite or private bathroom with shower or bath, hairdryer and complimentary toiletries. The pub serves a range of home-cooked food, and real ales from the St Austell Brewery. It has a wood-burner, beamed ceilings and limestone walls, as well as a spacious beer garden. Lostwithiel lies around 15 minutes' drive from Bodmin and the coastal town of Fowey. Tintagel Castle and the towns of Padstow and Newquay on the northern coast, are all 35-45 minutes away. Located just a 10-minute drive from the Eden Project, this modern hotel in Lostwithiel offers free Wi-Fi, an outdoor heated pool, free parking, and an on-site restaurant. All of the bright, airy rooms at Best Western Fowey Valley offer an en suite bathroom, a 32-inch flat-screen TV, free Wi-Fi, hairdryers, and tea/coffee-making facilities. Some rooms also offer king-size beds, luxury duvets, an iPod docking station, bathrobes and slippers. Best Western Fowey Valley offers modern comforts and traditional hospitality. The Conservatory Restaurant has seasonal menus offering Cornish produce, while the Lounge Bar provides local ales and a well-stocked wine cellar. The outdoor heated swimming pool is open for guests to enjoy from April to October. The Lost Gardens of Heligan are only 12 miles away and the stunning National Trust Lanhydrock House is just 3 miles away. The area has many little fishing villages. Other local beaches and beauty spots include Carlyon Bay, Par and Polkerris. The Globe Inn is located in Lostwithiel, just a 2-minute walk from Lostwithiel Railway Station and offers free WiFi. The Inn features a restaurant with outdoor seating. The rooms come with a view of the garden or River Fowey. Each room has an en suite with either a bath or shower, seating area and flat-screen TV. A selection of cereals, fresh fruit and a full English breakfast are available. The Globe Inn dates back to the 16th century, and has a bar with a dart board. The restaurant is Ã la carte and guests can enjoy their meal outside on the leafy terrace. Packed lunches are also available. The accommodation is located 7 miles from Fowey. The Eden Project is 5.7 miles away, and the Lost Gardens of Heligan is a 32-minute drive from The Globe Inn, and a 9-minute drive to Lanhydrock House. Welcome to the Royal Oak. You'll find a warm Cornish welcome at the Royal Oak Lostwithiel a popular pub with bedrooms A haven for locals and visitors alike the Royal Oak has been the hub of the local community for over 100 years. Situated in the small town of Lostwithiel, at the head of the estuary of River Fowey, Royal Oak Inn boasts elegant rooms, a restaurant, free Wi-Fi, free parking, and easy access to the picturesque Cornish countryside. Each room at Royal Oak Inn features an en suite bathroom, tea/coffee making facilities, and ironing facilities. Some rooms also offer views of the pretty town. A hearty breakfast, made of locally sourced ingredients, is served daily. The restaurant offers a varied menu which includes fish specialities, vegetarian options, and grilled steaks. Traditional carvery is served every Sunday, and guests are advised to book in advance. Guests can also enjoy regular live music ad evening entertainment. The famous Eden Project is 6 miles away and the stunning Lost Gardens of Heligan are a 30-minute drive from the inn. The coast is a 20-minute drive from the property. The Crown Inn Lanlivery Cornwall. one of the oldest pubs in Cornwall. Offering Local food and Cornish real ales as well as Bed & Breakfast in a relaxed atmosphere in one of our 8 letting rooms near to St Austell Bodmin Eden Project Lostwithiel Lanhydrock & Fowey. What better place to enjoy some great Cornish hospitality! . It is known that there has been an inn on the site since the 12th century serving weary travellers using the ancient track known as the Saint s Way. Much of the present building still dates from the 12th century although the pub was extended to house the stonemasons who built the charming church of St Brevita which is located just behind the pub. br / br / br / br / The pub oozes charm and has a wealth of features you would expect in a historic country pub. Low beamed ceilings open fireplaces thick stone walls and a great atmosphere. The restaurant is non-smoking and a great place to enjoy some fine Cornish fayre. For the historian amongst you there is a rather unique bread oven beside the old fireplace in the main bar which is unusually large and lined with granite take a peek inside! br / br / br / br / The tranquil beer garden in front of the pub is one of the prettiest in Cornwall and a great place to relax and spend an afternoon with a nice glass of Pimms. br / br / br / br / We have eight delightful en suite rooms. All our bed and breakfast accommodation have en suite shower rooms digital TV s tea & coffee making facilities. br / br / br / br / We have a free wireless internet service that is available in the main building throughout the Bar and Restaurant and public areas br / br / br / br / Dog friendly accommodation Cornwall. There are a restricted number of rooms for guests with dogs. br / br / br / br / We have been awarded 3 Diamonds by the AA for our rooms. Set in Lanlivery, Cornwall, less than 8 km from Eden Project, The Crown Inn features a sun terrace and views of the garden. Guests can enjoy the on-site restaurant. Every room features a flat-screen TV and tea/coffee making facilities. The rooms are fitted with a private bathroom fitted with a bath or shower. For your comfort, you will find free toiletries and a hairdryer. You can play darts at the hotel. The South West Coast Path is 8 km from The Crown Inn, on the Polperro Heritage Coast. The Lost Gardens of Heligan are 21 km away. The nearest airport is Newquay Cornwall Airport, 27 km from the property. UNDER NEW MANAGEMENT br / br / br / br / Just a few minutes from the coast Duke of Cornwall offers rooms with TVs and tea and coffee making facilities. A traditional Cornish breakfast can be ordered. br / br / br / br / The public bar features 1 pool table and gaming machine while the lounge bar has an open fire. Food is served in a separate dining room it is freshly prepared from local products whenever possible. br / br / br / br / The picturesque fishing village of Mevagissey The Eden project and the lost Gardens of Heligan and are all 15 minutes away. A great community pub with 2 bars a large car park and 7 guest letting rooms. Set in a busy location not far from St. Austell town centre close by are local beaches and ideally situated for many tourist attractions. The Duke of Cornwall caters well for locals and visitors alike. Just a few minutes from the coast, Duke of Cornwall offers rooms with TVs and tea and coffee making facilities. A traditional Cornish breakfast can be ordered. The public bar features 2 pool tables and gaming machines while the lounge bar has an open fire. Food is served in a separate dining room; it is freshly prepared from local products whenever possible. The picturesque fishing village of Mevagissey, The Eden project and the lost Gardens of Heligan and are all 15 minutes away. Small, modern, family run Bed and Breakfast with private off road parking. Free wifi, ensuite rooms. Midway between The Eden Project and Lost Gardens of Heligan. We are within walking distance from St Austell train/bus station are Charlestown harbour. A beautiful 1930s detached guest house with lovely countryside views, centrally situated for the whole of Cornwall. Only a 10 min walk to the town centre and bus/rail station and a 10 min drive to The Eden Project/Lost Gardens of Heligan. 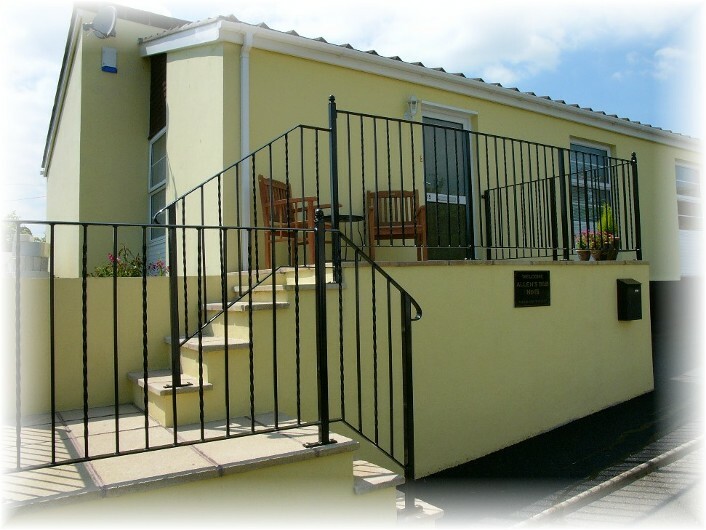 Superb St Austell accommodation, close to Eden Project, Heligan Gardens, Charlestown,Carlyon Bay Golf course and all major Cornwall attractions, comfortable, affordable, friendly with en-suite rooms,delicious breakfast free Broadband, safe parking. The Beech Tree Guest House is 4 Star Rated & ideally situated within St Austell town centre, near to both the train/bus station- both only a 2 min walk away- ideal for Eden & Heligan. We offer comfortable twin/double,ensuite ground floor rooms.